Today me and Panos attended CommunityOne and I have to say that the event exceeded my expectations. The sheer scale of this event was something I hadn’t seen in the past! Moscone Center was surrounded with street signs and people holding signs that pointed to the various designated areas. The general session that kicked off was broadcasted live on the internet, as one of the speakers informed us. I’ve spent most of my time in the RedMonk Unconference and also attended the Java Posse podcast recording during lunch time. Their podcast is my favorite one second to the Software Engineering Radio. Also I attended a session by Zend about their framework and how they are planning to implement Comet applications. I use the word “planning” because from what I understood they don’t actually have any concrete plans. For example the speaker talked about a Comet server implementation in C that a PHP app would use through CLI, but when I approached him with the question if this would be given out as a PECL module or about the licensing, he couldn’t disclose any information. Anyway, since more than 50% of web apps are made in PHP, I’d like this community to overcome the challenges that the Comet paradigm brings and do it in a timely fashion. I was also happy to accidentally bump into Reginald Hutcherson at the stairs. 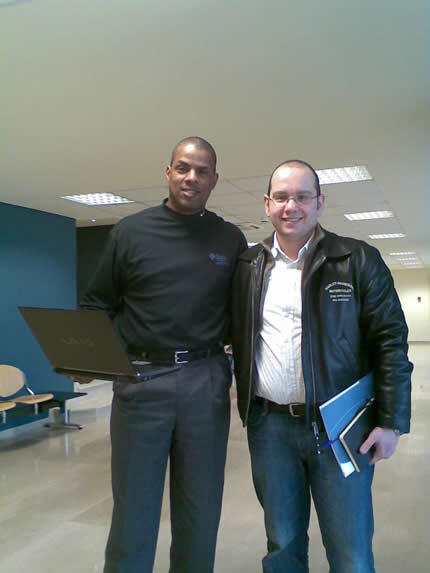 Regi is a Java Evangelist that has been regularly visiting us in Athens, Greece with his team. Having a pet dog I really-really enjoyed the fact that there are people inside Moscone that (are allowed to) go around with their dogs. Actually I’ve read that one out of two SF residents has dog. Two thumbs up people! Great stuff! Do try to keep the camera as still as possible, however. Small video cameras, light as they are, can easily produce a vomiting experience.